A solitary first-half strike from Nishan Burkart was enough to give Manchester United Under 18’s a 1-0 victory against Northern Ireland to lift the SuperCup NI Challenge Cup at a packed Coleraine Showgrounds. Manchester United's Nishan Burkart celebrates scoring against Northern Ireland during Saturday's SupercupNI Challenge Cup match at the Coleraine Showgrounds. It was Northern Ireland who started the brightest with Linfield winger Eamonn Scannell enjoying space down the left flank but both of his dangerous crosses were dealt with by United stopper Theo Richardson. The Red Devils took the lead with their first opportunity of the match as a neat passage of play between Lee O’Connor and Callum Whelan was rewarded when Burkart finished with a first time volley. On 15 minutes, Northern Ireland had a goal disallowed for offside as Ross Larkin fired home from close range, before United’s Mason Greenwood struck a free-kick just wide. Northern Ireland nearly found themselves level in dramatic fashion on 22 minutes as Cormac Lawlor’s cross inadvertently turned into a shot and went narrowly over the crossbar. However, two minutes later, Northern Ireland thought they grabbed an equaliser as Bobby Burns’ surging run and shot from 35 yards cannoned back off the crossbar and away to safety. Burns – who is on the books at Glenavon – was proving to be a constant threat and his cross on 36 minutes yielded a great opportunity for Daniel Reynolds who could only fire wide. At the start of the second-half, Reynolds found himself behind the United defence but his well hit effort was palmed away to safety by Richardson. Manchester United – managed by former Northern Ireland Milk Cup captain Kieran McKenna – nearly made Northern Ireland rue their missed chances as Burkart fired wide after being found in the area by James Garner. The Premier League side were beginning to carve out half chances as De’shon Bernard and Dylan Ravitt had shots on goal, before Conor Larkin was alert to deny Burkart. 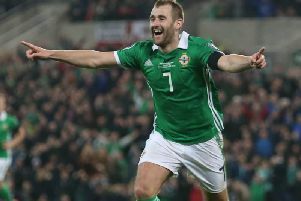 Northern Ireland pushed for a deserved late equaliser and missed a guilt-edged chance on 88 minutes as Burns’ lung-busting run and cross was headed wide by Ryan Strain, before Reynolds fired a lob over the bar after United ‘keeper Richardson dropped the ball. NORTHERN IRELAND: C.Larkin, Lawlor, Crane, McKenna, Toal, R.Larkin, Brown, Burns, Reynolds, Roscoe, Scannell. Subs Used: Kirk, Strain, O’Mahoney. MANCHESTER UNITED: Richardson, O’Connor, Williams, Dunne, Barrett, Whelan, McGhee, Garner, Burkart, Greenwood, Baars. Subs Used: Bughail-Mellor, Bernard, Spratt, Laird.